Manufacturer Refurbished - Includes Stand, Remote control, User manual and Power lead. Non-essential accessories (cables, adapters etc.) may NOT be supplied. 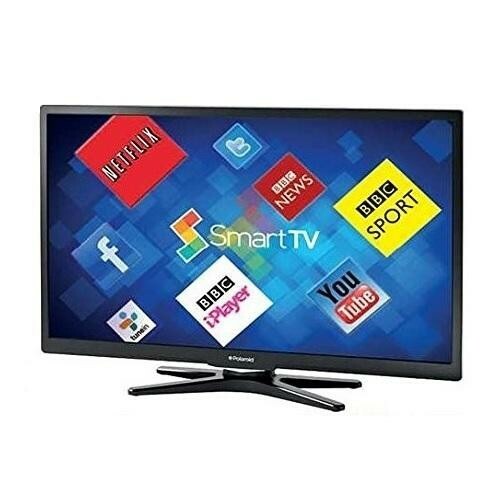 The Polaroid 3-42-LED-14 42 Inch SMART Full HD LED TV Freeview HD USB Playback is a great large screen TV which would be ideal for any family home, perfect as either the main TV or a secondary TV in a bedroom. The Full HD resolution combines with the LED display to give you a stunning image which is both clear and full of colour, the built-in Freeview HD tuner enables you to receive over 60 TV and radio channels for free without subscription plus an extra 12 HD channels including BBC and ITV ensuring there's always something for the family to watch. The amazing SMART apps on the TV allow you to access a wider variety of content, simply connect the TV through a WiFi dongle (sold separately) or the Ethernet port to your home network and away you go, enjoy catch up TV with BBC iPlayer, watch films and documentaries on Netflix, watch the latest viral videos on YouTube and even keep up with your social life with Facebook and Twitter. The TV has three HDMI inputs for your external devices such as a gaming console or blu-ray player, connect your laptop or PC through the VGA connection or plug in a USB device and view the stored pictures, movies and audio files directly on your TV.